For many people, this winter has been another one for the record books. With snow in early November, the polar vortex in January, and the snowfall of February, the arrival of an early spring is on everyones mind. I have to admit, this winter has been nice to me, Girona is a special place. The morning temperatures range from 0-7 degrees, followed by warmer temperatures in the afternoon.. I’ve been spoiled with wonderful spring like riding for 2 months now, so I can’t complain. But like everything else, all things must come to a close as I prepare to return home in March and change up my ride schedule. I’m very excited as cycling in Southern Georgian Bay this spring/summer/fall is going to be amazing. From the Collingwood Cycling Club launching their registration just last week along with the youth Mountain Bike Program, and CORC moving forward into their second year, it seems the cycling scene is in full swing for 2019. This year The Blue Mountain Gran Fondo is joining forces with Centurion Cycling and Sea Otter Canada is making its entrance into Canada and in no better place then Collingwood. This year will be packed full of awesomeness for anyone loving bikes! Here is a list of the dates and highlights so you can mark them on your calendar and get involved. CCC Registration - Club registration opened on February 15th, first 400 members registered before March 1st get the signature CCC jersey as part of the registration. Youth MTB Registration - Parents can now register their children for the CCC/Pedalpushers Youth Mountain Bike Program. (Free jersey with early bird registration). The focus of the Youth Program is safety, fun and mountain bike skill development. This program is designed for youth that have had some experience riding off road. They must be comfortable climbing, descending and shifting gears. Skills, drills and trail exploration are the foundation of the program. Each group will have a Coach or Group leader and Parent Helpers. Required age range for the program is 10-18. Early bird registration (by March 1st): $120.00 (includes free jersey valued at $100.00) + $35.00 OCA citizen license. If your child is racing Ontario Cups and already have a UCI license they do not need a citizen license. Regular rate: $140 after March 1st + $35.00 OCA license. NOTE: A FREE CCC MEMBERSHIP is currently included as part of the Program ($65.00 value). Program runs Monday May 13th to June 24th from 6PM to 7:30PM (excluding Victoria Day). Looking forward to seeing everyone on the road this spring! 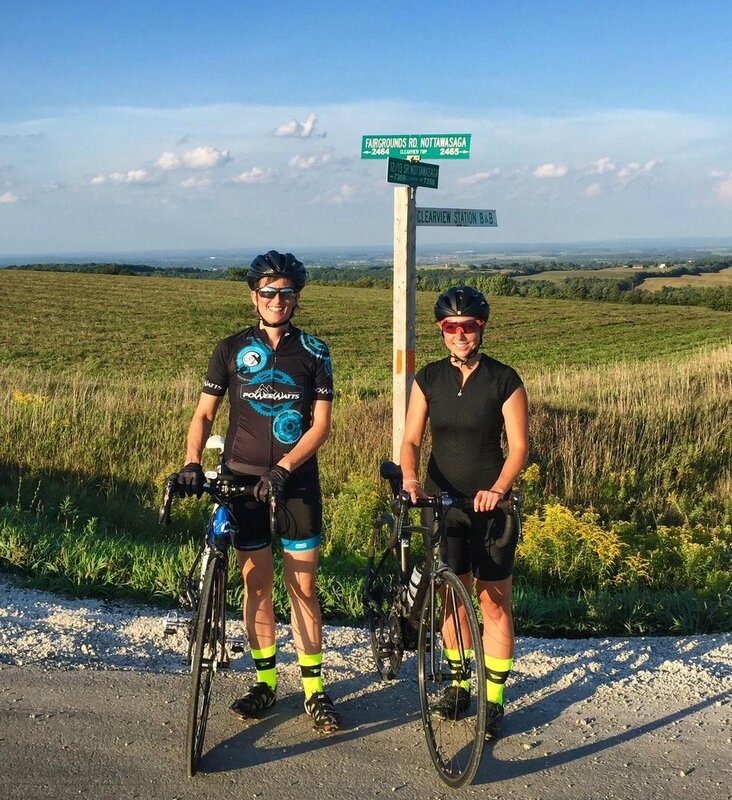 Recently I reached out to my good friend Nancy Newman, an active cyclist, teacher and overall amazing community member to chat about her upcoming ride across Canada. The planned route will see three local teachers (one driver and two cyclists), cross Canada from east to west over the course of July and August 2019. Here’s what Nancy had to say about the cause and what the next 8 months brings. 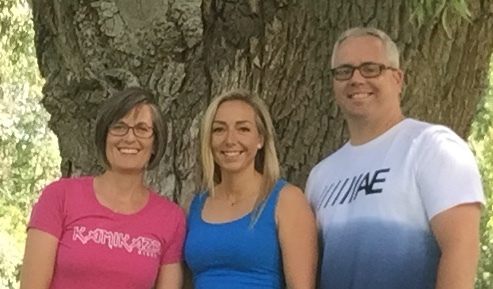 We are three teachers from Simcoe County, Ontario who will be travelling across Canada from Cape Spear, Newfoundland to Vancouver, British Columbia in July and August of 2019. Aaryn and Nancy will be cycling and James will be driving our support vehicle. We are in partnership with Royal Victoria Hospital in Barrie, Ontario and we have called our fundraising adventure “From The Rock to the Rockies”. Our mission is to raise $30,000 to help with educational programming at the Child and Youth Mental Health In Patient Unit at RVH. We are thrilled to take on this endeavour to help the youth of our area. With just over eight months left until we dip our back wheels in the Atlantic Ocean to begin our ride, training is really ramping up. We are doing outdoor rides when the weather allows and training hard at the Powerwatts Collingwood indoor cycling studio as well. We are also doing lots of strength training at the gym. We are very excited about the ride and have numerous events (speaking engagements, fundraisers...) coming up before next summer. If you would like to partner with us as a sponsor, please email us at fromtherocktotherockies@gmail.com. We are still looking for a couple more sponsors to help us out with our support vehicle and gas costs. Hey folks, I trust everyone is doing well after a long, long winter here in Southern Georgian Bay. I managed to keep myself busy in the basement riding endless loops of Watopia on Zwift and spending a little extra time on the side at the gym. Believe it or not, I got out skiing a handful of times as well. It seems spring is now here for good. As I sit in a local cafe typing away, outside the April showers are in full swing and I can't help but wonder, will the rain stop before the weekend? Sunday is forecasted for 17 degrees, I think a century ride is in order! So, what's happening in the cycling scene this spring? What's new? What's coming up? I have taken a bit of time to highlight the exciting up coming cycling events over the next few months. Now in its sixth year since re-establishing, the Collingwood Cycling Club launched their 2017 Membership campaign in February. Rumour has it 385 members registered for through the early bird program this year. Looks like it will be an amazing summer of riding with the club. Here are the dates to remember. Pedal Pushers runs a youth development program in conjunction with Highlands Nordic and the Collingwood Cycling Club. Trail Clean Up Day- Sunday April 22nd (mandatory). This is a great opportunity for all the kids to meet, bond and explore the trails. If you are looking to start riding bikes, maybe even get back in the saddle after being away for a while, Pedal Pushers is the solution to give you the confidence you need to get back at it. Noelle and her staff provide a non-intimidating environment to walk you through everything from gearing and basic riding techniques, to fixing that flat on the road and how not to get dropped on a ride. Pedal Pushers run corporate tours, one-on-one coaching and woman specific clinics as well as co-ed clinics. New for 2017 includes the "How not to get dropped" and Gravel Riding Clinics! A documentary about the bike and what an amazing tool for change it can be. It highlights a conflict in city planning between bikes, cars and a growing reliance on fossil fuels. Bikes vs. Cars depicts a global crisis that we all deep down know we need to talk about: climate, earth’s resources, and cities where the entire surface is consumed by the car. Activists and cities all over the world are moving towards a new system. But will economic powers allow it? Bikes vs. Cars, a new film project from director Fredrik Gertten, looks into and investigates the daily global drama in traffic around the world. The event will take place on Saturday April 22 in Weider Room (Blue Mountain Inn). Doors open at 7PM. Film screening will run from 7:30PM to approximately 9:30PM (including an intermission). Tickets are $10.00 each and 100% of the proceeds will be donated to The Environment Network. The event includes free popcorn (BYOB – Bring Your Own Bowl), a cash bar (with valid photo I.D. ), and draws for a selection of great door prizes! Purchase at The Environment Network (10138 Highway 26, Collingwood) or Red Devil Sports in the Blue Mountain Village. All proceeds to the Growling Beaver Brevet - Davis Phinney Foundation & Parkingo Wellness in support of Parkinson's Disease. In addition to the international race footage and athlete interviews, the film also follows director/athlete Kathryn Bertine’s quest to make the 2012 Olympics during her first year racing professionally for Team Colavita. Bertine, a three-time national champion of St. Kitts and Nevis, explores the issues faced when smaller nations try to make strides in a sport that has no history of tradition or support within their culture. The title HALF THE ROAD comes from a segment of the film where the president of a small cycling federation quotes the old adage, “Women hold up half the sky” in reference to equality. Our documentary explores the idea that, If women hold up half the sky, then the women’s peloton deserves ‘half the road’ of opportunity, growth, support & equality within professional cycling. Tickets sales to be announced soon. After a successful return to Ontario last summer, Canada Cup Downhill racing is back again at Blue Mountain Resort! From Cycling Canada... "The Canada Cup series is designed to provide competitive opportunities to the next generation of cyclists, transitioning from provincial race series to international competitions. Inspired by the vintage rides of Europe, Turas Mór – meaning ‘Great Journey’ in Gaelic - consists of two unique cycling routes on gravel and non-gravel roads through the rolling hills of Creemore. The Grey County Road Race (Saturday June 17th, 2017) and the Grey County Time Trial (Thursday Jun 15th, 2017) will be the sole Canadian qualifier events for the 2017 UCI Gran Fondo World Series. The events take place in Blue Mountain Village, Ontario which is located at the Southern end of Georgian Bay just outside of Collingwood, Ontario Canada. Keep aside July 15, 2017 for the 5th amazing year of mountain biking, friendly competition, fun and fundraising. Last year this local Mountain bike race raised over $95,500 for My Friend’s House. This year they are celebrating their 25th Anniversary, we want to help them by raising the most money we can. So get 4, 6 or 8 people together for a team, or if you’re brave enough - go solo, and get ready to fundraise and race. As always, your team can be male, female or coed and the race is open to children and adults. Early bird discount before May 1, 2017. Going into its 9th year, Centurion Cycling is a house hold name in the cycling subculture here in Ontario. With the C25, C50 and C100 courses all ready lined up for September, Centurion Cycling is piggy backing off of local events like the Growling Beaver Brevet, to bring you True Grit, its first gravel race for 2017. Introduced in 2015, the Growling Beaver Brevet, an all-road gravel grinder puts an exclamation mark on the end of the cycling season in the Collingwood area. If you find yourself lucky enough to be one of the 200 participants for 2017, you are going to experience one of the best days on a bicycle you could possibly dream of. The GBB is nothing like any other event around. It is a “brevet” style ride where participants travel from check point to check point receiving a stamp in their passport. Each control point puts on a spread of pastries, butter tarts, sticky knots, wood fired pizza, espresso and anything you can dream up. Local General stores from Kimberley and Ravenna, as well as the Bakery from Thornbury and Affairs Cafe in Creemore provide the perfect food at each station. The Growling Beaver has raised over half a million dollars for the Davis Phinney Foundation and Parkingo Wellness Society in just two short years. 100% of the funds go to help people living with Parkinson’s Disease “Live Well Today”. *The 2017 event sold out in just 8 short hours in March. The Growling Beaver Brevet – SOLD OUT! It’s been a hot summer for cycling in Southern Georgian Bay. As we approach the August long weekend, I can’t help but look ahead to the fall. After its introduction into the local cycling world last October, the Growling Beaver Brevet has once again sold (Note: this year there is a waiting list for participants that missed out on the early registration). The Growling Beaver Brevet made its debut in 2015 to celebrate cycling and to help people with Parkinson's to live well today. All fundraising proceeds will go to support the joint work of the Davis Phinney Foundation and ParkinGo Wellness Society. The Growling Beaver Brevet is a social (non-race) ride to celebrate cycling with 200 cyclists riding 40, 100 or 200 km routes through the scenic Beaver Valley at what should be the height of the fall colours. The day will feature Beaver Valley and Georgian Bay communities and merchants that have supported cyclists through the summer season. The routes have been conceived with a mix of tarmac and scenic country gravel roads. Every rider will carry a “passport” that will be authenticated at checkpoints. Check out the new, freshly released today video from Cycle Simcoe. I’m spending my August long weekend bike packing around Southern Georgian Bay. I’m super excited about a project I’m working on with our friends at Cycle Simcoe. Keep your eyes peeled in an upcoming blog about my day tripping experience around Southern Georgian Bay. As usual, I’ve looked over my favorite weather services for the long weekend forecast. There are conflicting predictions, but for the most part the weather looks great. Winds this weekend will be fairly light out of the N to NE to NEE, depending on the day. Saturday looks like a great day to be out on a bike. There is a bit of conflict with the Sunday forecast, with one weather service showing sun and cloud, while the other predicts rain on and off for the day. You may want to keep a closer eye on Sunday’s weather as it nears. Holiday Monday looks like a perfect day for a long ride. Have a great weekend, hope to see you on the road. As we near the end of July each year, Collingwood becomes filled with fanatical Elvis fans. With over 30,000 visitors to the area, you can expect the roads in and around town to be very busy starting Friday morning and running through until Sunday evening when the tribute king is crowned for 2016. This years event will draw some 100 tribute artists all competing for their spot in Graceland. If you plan on riding downtown be sure to take a lock with you. The Scott team will be at 3 Stage this Saturday morning at 10am-3pm with a ton of bikes for you to demo and try out. Elvis weekend is typically a perfect summer weekend. It's not too often that we get a lot of rain at the end of July, and with the drought we have been experiencing over the last few months, there is nothing but hot summer weather coming our way again this weekend. On Friday the heat warning will remain in place, but is said to be removed for the the weekend with temperatures still high, but below the trigger mark for the heat warning. Temperatures in the high 20's to mid 30's can still be expected for Saturday and Sunday. Winds will be moderate coming from the NW on Saturday and then switching to the S and SE on Sunday. I'll be riding towards Kimberley on Saturday and Creemore area on Sunday to take advantage of the tail winds home. Be sure to drink lots of fluids both before, during and after your ride this weekend, its going to be warm. Have a great weekend of riding, hope to see you on the road! I have a little secret, I know a local place you should ride to that I can almost guarantee you haven’t been. New route, new road. I know, I know…I can hear all you locals say…”I’ve ridden all roads in this area and drank coffee at all the cafes, what are you talking about?”. Scotch Hollow Market & Deli is located in the heart of Singhampton, to the rear of Mylar and Loreta’s parking lot. New this spring, owners Scott Holmes and Kate Sparling have been huge supporters of cycling and mountain biking in the area for many years. The cafe is open most days between 10am - 5pm (10am-4pm Sun & Mon). I’ve been up to visit a handful of times now and love going back. Great staff, fresh coffee, all local baked goods, deli sandwiches, small pizza’s, oat bars, butter tarts and of course ice cream (last weekend they included fresh strawberries on it!). So your asking, how do I get there? Personally, my favourite route includes gravel, so most of the time I take my cx bike. If you are setting out for a back road adventure, head straight up Tenth Line, climb up to the Duntroon quarry. Turn left onto Grey Road 31/Simcoe Rd 95 and continue south straight into Singhampton (Scotch Hollow will be on your right). If you prefer all paved roads, head up the Pretty River Valley, take a left at Rob Roy and follow Grey Road 31 all the way to Signhampton. There is plenty of construction going on at the top of the valley this year, however, you should be fine if you stick to Grey Road 31. The Scotch Hollow Market & Deli follow the simple philosophy “Shop local, Eat local, Spend local, Enjoy local”….we might as well add Ride local, I think it fits just fine with the rest of the mantra. Stop by and check them out, I promise you won't be disappointed. It looks like another amazing weekend to ride! Mid summer means the middle of road construction season in the area so there are still a few places to avoid. Construction on Fairgrounds Road has been completed from the railway tracks just south of Airport Rd to County Road 91. Grey Road 31 also has new pavement along with a healthy 1 meter shoulder for bikes (thanks to a group of locals rallying the County of Grey this past winter). Places that are still torn up include a short section at Rob Roy heading south one concession as well as Grey Road 119 from Banks to Ravenna. If you avoid these two sections, you should have a great weekend of riding. The weather outlook couldn’t be better, sunny with temperatures in the mid to high twenties on Saturday and Sunday, with a light winds out of the west. Pretty idea weekend to ride. Canada Day is a great time to head out with a group of friends and explore the area. Unfortunately this Friday doesn’t look so great for weather. If you are willing to deal with the rain and wind, stick close to the area and do a coffee run. If riding in wet weather is not your thing, it may be a good day to check out all the tent sales around the Collingwood area and get stocked up for the next winter. Noelle Wansbrough from Pedal Pushers has been guiding corporate groups now for a few years. On June 23 Pedal Pushers hosted their first corporate day of the year for a Toronto based Company with special guest George Hincapie. The event included an all-inclusive day of riding in the Collingwood Beaver Valley are area, with 80km and 100km route options. With 7 guides, 2 swag vehicles, bike set ups from Kamikaze Bikes and the on road help from Velofix, the Pedal Pushers corporate day was extremely successful again this year. This weekends weather looks much better for Saturday and Sunday. On Friday the weather gods suggest that we will see rain for the majority of the day with winds picking up in the afternoon. There will really be no great time to get out and ride, so if you are looking to get out, take your rain jacket with you. If riding in the afternoon, stay as sheltered as possible (Georgian Trail), as the winds are expected to pick up to 50km/hr. Saturday and Sunday look much better with typical summer temperatures in the mid twenties and winds out of the W or NW or WN. Have a great Canada Day long weekend, hope to see you on the road. It’s been a great week for riding in and around the Southern Georgian Bay area. Temperatures have been seasonable and very pleasant for riding. This weekend looks like another epic weekend to hit the roads and trails in the area. “All for the love of BIKE”, quoted right from the Blue Mountain Village website. This weekend marks the 2016 PedalFest happenings out at the mountain. What should you expect? A kid’s bike parade, bike demos, bike shows, live music, guided and self-guided trail rides and tons of other awesome activities. This is the first year the Mountain will be hosting the East Coast “Canada Cup” downhill race which promises to be awesome for spectators! So if you are looking for something to do, or a place to end or start your ride this weekend, check out the Village at Blue, it looks to be a pretty awesome venue for cyclists. Stay Safe on the Roads in Ontario! Road cycling, and in particular, road cycling in groups tends to be a highly controversial topic. Misunderstandings surrounding the highway traffic act (HTA) being the primary culprit. With that in mind, Cycle Simcoe recently partnered with Tourism Simcoe County, RTO7 and Grey County, on a series of cycling safety videos. These videos, directed towards both cyclists and motorists were developed to clarify the rules of the road and encourage all road users to co-exist, practicing courtesy and truly 'Sharing the Road'. Not much to say, it’s a green light for riding this weekend here in Collingwood. Saturday looks great with very low winds out of the NW and temperatures in the high 20’s. On Sunday the winds will shift to the south and a few clouds will move it. Thunderstorms are expected later in the afternoon, so if you plan to get out, take advantage of the morning and early afternoon hours. Have a great weekend of riding! Hope to see you on the road. During the hurricane winds of last Sunday, I had the chance to pre-ride the 6 hours of Gibraltar course with a little instruction from a local MTB legend. This race is now in its fourth year and it has become without a doubt the highlight of the season for most locals that shred the trails in the 3 Stage area. The past two summers I have been away from the area during the event, so this year is the first time I will partake in the festivities. Anyone who knows me will be surprised to hear that I'm jumping on a mountain bike, but I must admit, I had a blast on the course last weekend. It was fast, with a ton of corners, a few little climbs and plenty of speedy descents. Just as you get into your groove, a small rock garden is thrown in just to add a little excitement and slow you down for a second or two. The course is great for all abilities and I’m really looking forward to the event on July 9th. The event is open to everyone and has a 4 person category, a 6-8 corporate team division or if you are brave enough, a solo category. Last year the event raised $140,000 for the local My Friends House charity. My Friend's House is a non-profit organization providing emergency shelter and counseling services to abused women and their children escaping violence in their personal relationships. Day Time Running Lights (DTRL's) are becoming more popular on the road nowadays with cyclists. Over the winter there has been a lot of talk on the interwebs and bike forums about day time running lights (DTRL’s) on bicycles. I remember reading an article (which I can't find anywhere now) about a group of roadies in California who have started riding with DTRL’s to increase their visibility during the normal hours of the day. Its funny, I believe most people won't use DTRL's because they actually think it's “uncool” or they are afraid of being the only rider in the bunch with lights on during the day. As cyclists we need to change the way we think and have a better understanding on how drivers see us on the road. For the most part, this year i have been riding with front and rear DTRL’s. It doesn’t matter if it is sunny and bright, I use them if I have them. According to a little research I conducted, motor cycle collisions were decreased by 26% when DTRL’s were used. So where does that leave us vulnerable cyclists? I’m actually beginning to think people are crazy for not using them, DTRL's make you more visible on the road any time of the day. In Ontario, the law requires us to have a white front light and a red rear light or reflector if you ride between a half hour before sunset and a half hour after sunrise. The law does not speak to DTRL's. I believe that as a cyclist, it's in our best interest to do everything within our power to be seen on the road. DTRL’s are the way of the future for road cycling, time to give it a chance. Check out your local bike shop and get fitted with some new lights. Quick tips- spend money on lights, they are expensive but may save your life. Don't buy small ones, they are typically useless and can't be seen. Make sure they are rechargeable so you can plug them in after every ride. In fact, it doesn't hurt to have two sets, that way one can always be charged and ready to go. Looking to demo a new bike for the 6 hours of Gibraltar? Squire John's is hosting a Rocky Mountain Demo Day tomorrow at 3 Stage between 10am-3pm. Test ride the latest bikes with new school handling and geometry from Rock Mountain. There is some construction going on this weekend the you may wish to avoid. Grey Road 119 from Banks to Ravenna is closed for surface modifications. The County of Grey has also started a bit of construction on Grey Road 31 east of Rob Roy (portion of the local ride called the Newman Loop). There are a few ridable gravel sections, but you may just want to avoid this area all together. Last weekend was really a disaster for any great road riding here in Southern Georgian Bay. The high winds really put a damper on all the excitement for riding. This weekend looks like it could be the best one yet of 2016, both Saturday and Sunday will have temperatures in the high twenties with very low winds out of the west and north west. This may be the time to break out the sun sleeves and sunblock, its going to be a hot weekend! Pack lots of fluids and be sure to stop at all those cafes along the way to refuel! A few years back I rode from Collingwood to Midland for the annual Butter Tart Festival (dubbed "Ontario's Best"). Anyone in the cycling world (at least in Canada) will understand that any good ride should include the chance to devour a few butter tarts along the way. There are several amazing places to ride to from Collingwood that all have an incredible selection of these heavenly treats; Giffen’s County Market, Affairs Cafe, Kimberley General Store and of course Ravenna General Store. The great thing about the Midland Butter Tart Festival is that you can ride to one place and get the worlds best BT selection. This ride differs from others in the the area because it is completely flat, zero climbing. From Collingwood it is a 120km return ride, so you will need a bit of time to do it. For those looking to reduce the length, you can ride out of Wasaga Beach and take 40-50 km off the ride. I have included the route below. The weekend weather looks to be a bit of a mixed bag. On Saturday, Environment Canada is calling for a 60% chance of thundershowers with the temperature around 26 degrees (humidex is around 34 degrees). The afternoon looks better for riding if you are planning to get out. Sunday looks amazing at first glance, but when you take a closer look, the winds will once again move in, just like they have all this week. Right now the weather gods are forecasting 26 km/hr winds out of the NW gusting to 40 km/hr all day. There will be no real ideal time to ride on Sunday, so when you do, make sure you head out in a northwest direction (towards Thornbury and Frogs Hollow) so you can enjoy the tail wind home. Looking for something to do this Thursday evening? Cannondale is bringing their demo fleet of MTB’s from the Ontario wide #LeftyTour to the trails up at 3 Stage. The event starts at 4pm and goes until dusk. Why should you demo a bike? There are so many reasons to demo a bike when the opportunity presents itself. I always take advantage of events like this, it’s good to stay in tune with the cycling industry, the technology, the different styles of frames, new components and anything else that may be new since your last bike purchase. Always bring your own helmet and pedals, and don’t forget your shoes. Do your best to have the bike set up so you are comfortable with it, but remember that it's just a demo session, so you may not be able to have it dialled in as much as you would like. For the test ride make sure you start off slow and take a bit of time to get use to how the bike rolls, corners, shifts and brakes. As you feel a little more confident, test out the braking, take different angles and speeds into the corners, spend some time climbing/descending and basically get to know the bike as best you can. Don’t forget to ask for the low down on the bike itself; what makes it different and unique from everything out there on the market. After the success of last weekends Grey County Road Race, we have another jammed packed weekend of cycling coming to our area. The weather this weekend looks great for Friday and Saturday, but with the shift in winds to the north east, we will see a bit of rain on Sunday from noon on. If you are planning any long rides this weekend, you may want to get them in on Saturday while the suns out and the roads are dry. For a few years now the Collingwood Cycling Club (CCC) has been involved in the youth mountain biking clinics out at Highlands Nordic in Duntroon. Last year, Pedal Pushers paired up with the CCC and build on the already proven Trail Blazers program. In 2015, 40 youth from the Collingwood area participated in the 10 week program, it was a huge success. This year the program exploded with over 60 kids registering. Every Monday evening you can find kids of all different ages and abilities learning cycling and mountain biking skills in a safe environment with the extremely qualified Pedal Pushers coaching staff. The program runs from May through to the end of June. Its amazing watching the kids learn proper cycling skills at such an early age, I'm very jealous that I didn’t have a chance to do something like this when I was just a wee lad. Registration for this program starts in February at the same time as registration for the CCC. For more information you can contact Noelle at Pedal Pushers or watch the Collingwood Cycling Club Website next winter for registration info. Cost: Early Bird rate $100 (includes $50 jersey), $130 after deadline. Not sure if you're fitness level is up for the challenge? While mountain biking does require a certain level fitness from riders, we have a full range of lessons that cater towards riders of all abilities. Many of our lessons run at multiple levels, allowing you participate in a group that suits you best. Don't miss out on this opportunity to ride on purpose built trails in a private estate setting. Trails are suitable for all levels of cyclists. Commit your long ride this weekend to Saturday morning. With all the lilacs out in full bloom right now, its a great time to take advantage of the Georgian Trail system. Jump on your urban bike or cross bike and head to Thornbury or Meaford for lunch. McGinty’s on main street in Meaford is a great place to stop for an amazing custom made sandwich and some great pastries. Round trip on the trail (totally traffic and car free) from Collingwood to Meaford is 70km. If you are looking for a decent road ride, I'd personally take advantage of heading into the Beaver Valley, climbing Bowles Hill, Epping or up to Eugenia and having a break at the Emporium in Eugenia or the Kimberley General Store. Just keep in mind that the winds will be shifting this weekend to the north east, so you may be facing a bit of a head wind on the way back…if thats the case, just make sure you return from the Beaver Valley via Grey Road 31-Grey 2-Grey 19, its the most sheltered route. Looking for a particular route, message me and I’ll see what I can put together for you. Registration is now open at for this years Growling Beaver Brevet at www.growlingbeaver.comThe event is a "gravel grinder" ride that has distances of 40km, 100km and 200km. With Side Launch Brewing Company as home base for this event, you don't want to miss out! The GBB is a fundraising event for cyclists by cyclists. The principal aim is to raise money for the Davis Phinney Foundation and their Canadian partner, ParkinGO, to help people with Parkinson's Disease to "live well today." We run our event to shower our supporters, you the fundraising riders, with affection, food -- and beer. It's the least we can do for how you've helped us. This event is already 50% sold, so register early if you plan to raise money and ride. Have a great weekend of riding, hope to see you out there! It’s hard to believe that the end of May is here, it seems just like yesterday it was March break and Mother Nature kept taunting us with cold arctic air adamant to keep us off our bikes. For the past few years here in Southern Georgian Bay, the end of May marks the Grey County Road Race & Time Trial. This event was first introduced to this area three years ago by Bruce Bird, organizer and cyclist. Originally it was started as an Ontario Cup event and attracted avid amateur cyclists from all over province. Last year the event changed and became a sanctioned stop for the UCI World Cycling Tour (UWCT) which was formed in 2011 by the UCI. In 2016 the event has been renamed as the “UCI Gran Fondo World Series”. There are 14 qualifying events worldwide where the top 25% in each age group will qualify for the Amateur World Championships. The TT this year has changed location and will start and finish in Thornbury. The course itself is 29.1km long, climbing up Grey Road 40 and descending back into Thornbury via 33rd Sideroad. From the research I have done, it appears the starting line will be at the Town’s water tower on Victoria Street South. The finishing line will be on Alfred St. W. between Beaver St. S. and Victoria Street by the baseball diamonds. This would be a great spot to watch all the riders start and finish if you are looking for the best place to cheer. Another great place to help support the riders would be at the top of the Grey Road 40 climb. This vantage point would be great as the riders will well into the suffering by that point and may all the encouragement they can get to get over the climb. The TT event gets underway at 5:15pm tonight. This course will not disappoint. I have spent the last month riding it and I must say that there will be some tired riders at the end of this one, there is no hiding from the climbing, no sitting in a pack and just spinning, riders are going to have to work. Depending on the age group, racers could see themselves climbing Scenic Caves up to three times during the race. If this wasn’t bad enough, add in the Red Wing climb and the 7.5km ride up through the Pretty River Valley. This course will hurt. The races all begin in the Village at Blue Mountain starting at 8am. The finish line is on Swiss Meadows Blvd near the top of Scenic Caves Road. Where should you ride this weekend? With all the activity on Friday night and Sunday, you should really plan your rides accordingly. Saturday is wide open, since the race is on Sunday, it would be best to take advantage of cycling over in the Beaver Valley area, maybe check out Bowles Hill or Epping and grab a lunch from Stacie at the Kimberley General Store or a panini in Ravenna. On Sunday, most of these roads will be involved in the race, so unless you are riding to cheer on friends, you may want to steer clear of them. Sunday would be a great day to venture on the flats over through Wasaga Beach eventually ending up in Balm Beach. This is a 100km return trip from Collingwood and utilizes none of the roads that the race will be on. Another option would be to head to Creemore, Glen Huron and Maple Valley. Be sure to stop in Creemore at Affairs for lunch or Giffen’s for buttertarts or breakfast. As usual, Curries Farm Market is always the best place for après once you arrive back in Collingwood. I hope this helps you with your weekend riding! See you on the roads. May Long Weekend- Where to ride? Spring has finally arrived and the forecast for the May long weekend couldn't be any better! Many of the signs of spring have started to show in the Georgian Triangle and there are a few places you may want to consider checking out on the bike this weekend. Here's my list of places to ride and places to avoid to make your experience more enjoyable. Ride through the Pretty River Valley, with all the leaves and smells of new life just coming out, you will find yourself smiling from the top to the bottom of the climb. End up at the newly renovated Feversham General Store for a coffee. Take on the section of road between Dunedin and Glen Huron, honestly, it will feel like your riding in Ireland it is so green! Make a quick stop at Giffen's in Glen Huron for breakfast. Take on the newly paved Scenic Caves climb and descend down through all the apple orchards past Loree and check out all the apple blossoms that just came out this week. Grab a panini at Ravenna General store for lunch on your way back to Collingwood. Start and end all your rides at Curries Farm Market in Collingwood….opening for the season this weekend and they have a full new setup outside for cyclists! 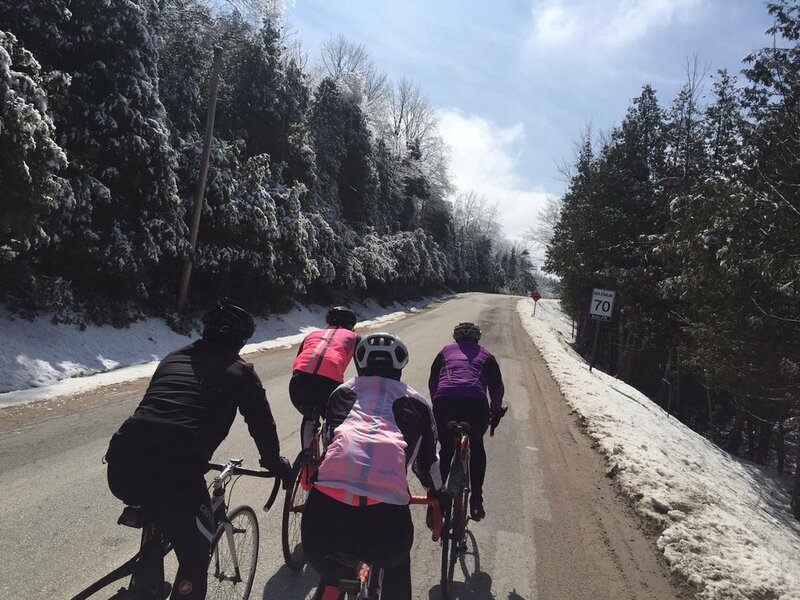 Anywhere near Wasaga Beach- with the current forecast, Wasaga will be the last place you want to be on a bike. The traffic will be backed up with cottagers heading to the beach and the number of cars will make it unsafe and nearly impossible to ride. Grey Road 31 between Rob Roy and Grey 2. The road is currently closed for a bridge replacement. Looking forward to getting out and riding this weekend! Hope to see you out there. Each spring before I get my bike out on the road I like to do a few things to make sure it is operating properly and ready for a full season of use. If you’re anything like me, the last thing you want is to be left stranded on the side of the road because of a broken brake cable that could have been completely avoided for a small cost. Each spring I put my bike through a few key maintenance items to ensure my early rides are free of any mechanicals, the last thing I want is to be left behind while my friends ride off into the horizon. Cables and Housing - Some will say it isn’t necessary, but I replace my brake and shifter cables on my bikes each spring. Depending on the age of the housing, it may need to be replaced as well. Little do most people know that this small change can increase the smoothness of your shifting and braking, improving your all-round efficiency and confidence on the bike, who doesn’t want that? Cables and housing are super cheap, always say yes to this service if you can’t remember the last time they were replaced. Tubes and Tires - I tend to leave my tires from the previous year on all winter. The spring is a good time to replace the tires if you don’t remember when you put them on. There are several other factors you may want to consider as well. If the rear wheel is worn flat, if you can’t located the wear indicator, or if the rubber looks cracked and flakes off when you run your thumb over the sidewall. Tires can be a bit more expensive to replace, but well worth it. I always put new tubes in each spring before I start riding, its simple and cheap. Drivetrain - For those of us that have the knowledge to take apart the drivetrain on our bikes, tend to break them down each spring to make sure the bearings in the bottom bracket are working well and don’t need to be replaced. I completely clean the chain, rings and cassette with a good degreaser. I also clean the front and rear derailleur . Once everything has been degreased, I re-lube the components and put them all back together. This is also a good time to check chain length to make sure its not time to replace it. Determining chain stretch is something that should be left for your local bike shop (LBS). If the chain needs to be replaced, don’t be caught off guard, your LBS may suggest that you replace the cassette and chain rings as well, this will be a very costly, but well worth it. Nothing feels better then a fresh clean drivetrain! Keeping the mechanical parts well lubed and clean are the key to making your bike last longer and run more efficiently. I would suggest that you get your bike to your local bike shop or mechanic during the winter months so you have it ready to go for that early March day when the temperatures are warm enough for you to get out. Local places to take your bike in the Collingwood area include Squire John’s, Kamikaze bikes, or call Velofix for home service. I don't know about you, but winters for me here in Canada can be extremely long and cold. Over the past few years I've spent a lot of time in my basement on my trainer watching numerous hours of Netflix and listening to music. When it comes to training inside during the colder months, I guess you could say I'm a bit of a loner. I'm highly motivated by my inner self and really enjoy getting on my trainer at the same time everyday. This works great for the most part, but what I really miss is the social aspect of the group ride. So...how does someone get the benefit of a interval based workout indoors with the added bonus of a group ride? Why not give Powerwatts Collingwood a try. Powerwatts Collingwood is located at the Peak to Shore Physiotherapy and Sports Medicine office on the corner of First Street and Hurontario Street. One of the first things you notice when you walk into the studio is that there are only four bikes. This may seem strange to some, but it actually makes for a nice intimate experience. Picture yourself riding with three of your best friends on a Saturday morning while chatting about the week and still getting your workout in. There's no distractions of other people walking in, just you, your mates, a Powerwatts certified Coach and the challenge of the Powerwatts course. Now don't get me wrong, this is no ordinary spin class. 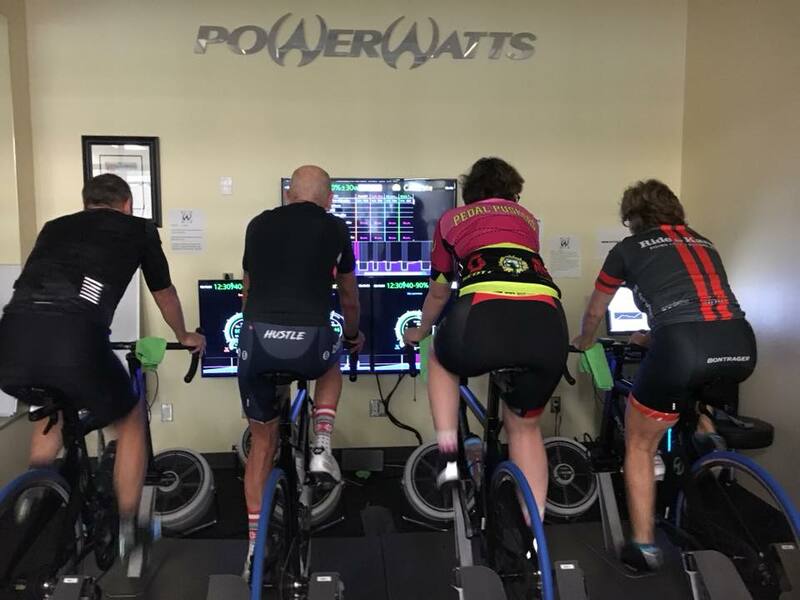 Powerwatts is a "Power" based training system that helps you really focus in on the watts that you generate while pedaling, your cadence and the overall efficiency of your pedal stroke. If anything, I would suggest that it's unlike any class you have been to before. At first you'll be inundated by numbers; your power, cadence, speed, time of interval, percentage of FTP, but you will quickly learn the system and after a few minutes it becomes like a video game where you find yourself trying to keep the numbers on target. Over the course of one or two visits you quickly become addicted and before you know it, you'll be purchasing the ten pack to keep you busy through the winter. Video Credit - Jeff MacInnis on 2015-12-16.